by Timothy Bourke, Jean-Louis Colaço, Bruno Pagano, Cédric Pasteur, and Marc Pouzet. This page contains source code in support of our CC 2015 submission. Models are given for Zélus and Scade 6. This example demonstrates a simple discrete node that increments an internal counter whenever a tick input is true and resets it whenever a res input is true. To test the program, we set tick to false at the second, and then every 6 instants, and res to true when the counter became 4 at the last reaction. The program text above differs from that given in the paper: it is written in Zélus, not the kernel language. 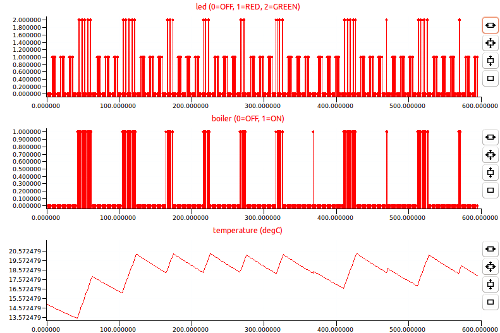 The program also contains additional commands to produce the plot shown below. This program compiles with the version of Zélus available from this site. We simulate the true (1.0)/false(0.0) tick input (the red dots) and reset the counter (the green dots) when it reaches 5. 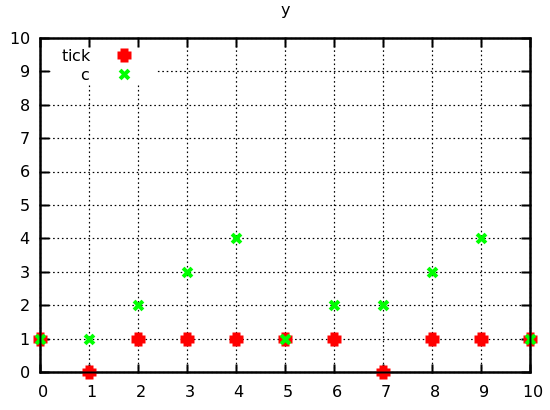 The same program expressed in the graphical syntax of Scade is shown below. A single state automaton with a self-loop is used to implement the reset. Compiling this program with the standard version of KCG produces, amongst others, the two files included below. This header file defines the state record for the counting node. There is a state variable of type kcg_bool that records whether or not the node has been initialized, and a variable of type kcg_int to store the counter value. The counting.c source declares two functions: one to reset the node, and another to calculate its behaviour at a discrete step. This example demonstrates the hello world of hybrid modelers: a bouncing ball that loses energy at each impact. The Zélus source code above has three nodes: bouncing, the model from the paper, plot, a discrete node for generating the plot shown below, and main, for connecting everything together. A collision of the ball with the ground is detected using the up operator, which watches for rising zero-crossings. The resulting event z triggers a reset of the y' continuous state variable. The results are shown in the graph below. The bouncing node is expressed in the textual syntax of Scade below. In this version, the continuous variable y_v is defined over two branches of the activate operator. The first one gives its value at instants when a falling zero-crossing is detected via down y. The second defines its derivative at other instants. Compiling this program with a prototype version of KCG produces, amongst others, the two files included below. This header file defines the state record for the bouncing node. There are two continous variables of type kcg_cstate, one zero-crossing expression of type kcg_zc and a discrete state variable of type kcg_bool. 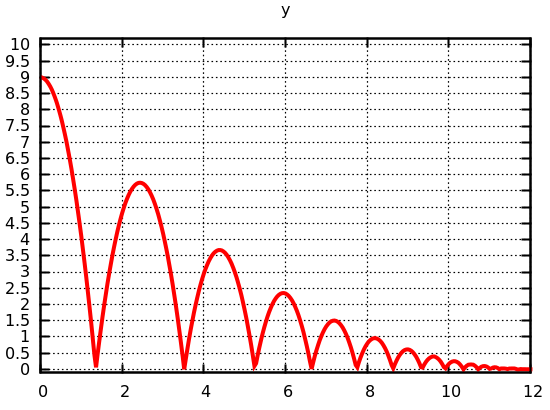 The bouncing.c source includes separate functions for initializing and resetting the bouncing node, for calculating its behaviour at discrete instants, for calculating its derivatives at continuous ones, and also for calculating the next horizon. 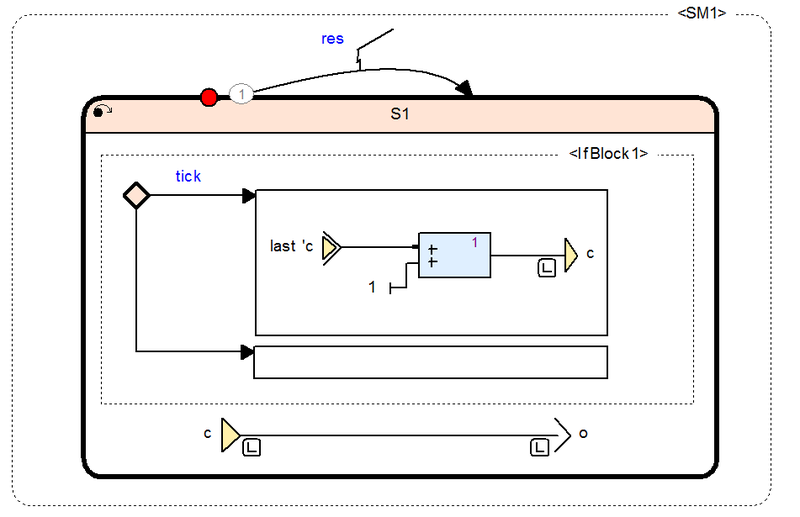 This model is a reimplementation of the Mathworks Simulink example [Bang-Bang Control Using Temporal Logic]( http://www.mathworks.com/help/simulink/examples/bang-bang-control-using-temporal-logic.html). Zélus does not have fixed-point data types, so we have to manually track bias and slope for integers representing rational values. -- at a zero-crossing instant.